To capture thrilling first-person views of your epic moments, to really share the rush with your friends and family, you need a camera that's rugged, sure—but you also need a camera that takes outstanding photos and videos. The waterproof, freezeproof and shockproof COOLPIX AW120 delivers the image quality your big moments deserve. Strap it to your chest with the optional Chest Harness (sold separately) and record mind-blowing Full HD 1080p videos with stereo sound, smooth slow motion sequences and high-res photos, even in challenging conditions. When things get bumpy, Nikon's new Hybrid VR system helps keep your shots sharp and steady. The camera's superb wide-angle (24mm equivalent) f/2.8 NIKKOR glass lens gets more in the frame and captures bright, sharp images that will have you reliving the action on your "off" days. You don't even have to wait to share the rush—with built-in Wi-Fi®, your COOLPIX AW120 shots can instantly appear on a compatible smartphone or tablet for easy sharing. Your friends will be jealous they weren't there! The COOLPIX AW120 handle all that Mother Nature can throw at it. Take it diving to depths of up to 59 Feet. Shoot at temperatures as cold as 14 °F. And don't sweat drops of up to 6.6 Feet. Whether it's in your hand, mounted to a surfboard, clipped on a backpack or attached to a scuba tank, every twist, splash, dive and crash can be recorded in both still and Full HD 1080p movies. Plus, Nikon's Action Control brings fast and easy operation to gloved hands. 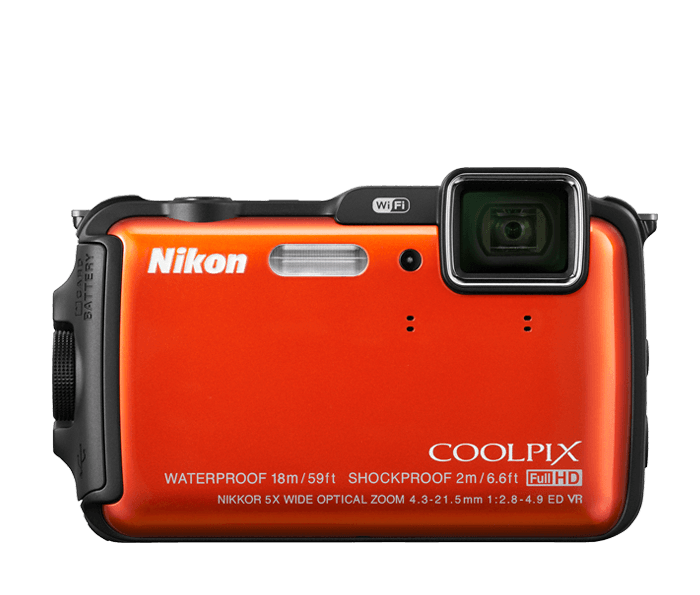 The COOLPIX AW120 lets you capture every thrilling moment from inside the action—not the sidelines. Your smartphone or tablet will be your favourite accessory! Take beautiful photos with the COOLPIX AW120 and watch them instantly appear on your compatible smartphone or tablet. Then share them without missing a beat—text them, email them, upload to your favourite social networking site—it’s your choice! You can even use your smartphone or tablet as a remote control for the COOLPIX AW120, perfect for self portraits and group shots that actually include you. Relive the excitement of your travels in a whole new way. The COOLPIX AW120 records the exact location of each shot you take, so you can follow the path of your adventure and every stunning view along the way! Share your journeys on Google Earth™, Google+™, and other social networking sites, or with the downloadable Nikon View NX2 software. Built-in mapping and Electronic compass also help you navigate unfamiliar destinations, and Points of Interest (POI) show you nearby photo-ops like scenic lookouts and historic landmarks. The COOLPIX AW120 is the ultimate travel companion! There’s nothing worse than a shaky handheld video. As soon as you start recording with COOLPIX AW120, Hybrid VR (Vibration Reduction) activates and combats camera shake for sharper steadier home movies. It's frustrating when a smartphone camera focuses on the wrong thing. With COOLPIX AW120, Target Finding AF quickly determines your intended subject and puts the focus where it belongs—on your subject.